A new paper published in Quaternary Science Reviews reconstructs CO2 levels during the termination of the last ice age and finds CO2 spiked to levels near or even exceeding those of the present, obviously without any human influence. According to the authors, "The record clearly demonstrates that [CO2 levels were] significantly higher than usually reported for the Last [Glacial] Termination," with levels of up to ~425 ppm about 12,750 years ago, which exceeds the present CO2 concentration of 395 ppm. 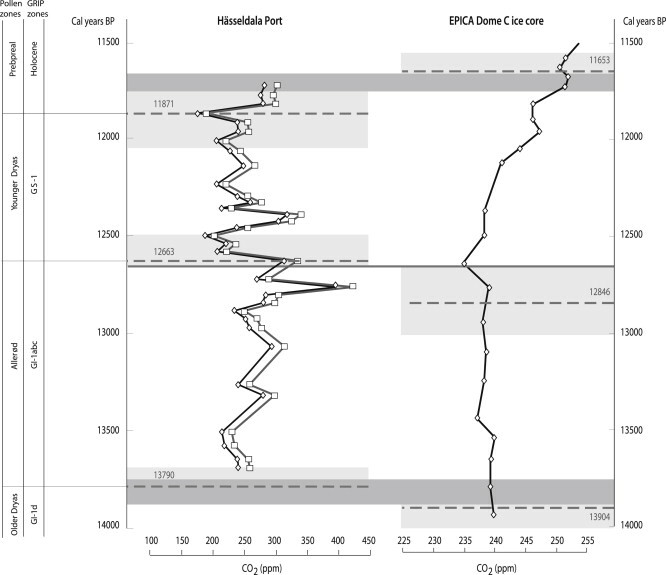 Left graph shows CO2 concentrations varied dynamically between ~220-425 ppm from 14,000-11,500 years ago. Ice core comparison is shown at right. A new stomatal proxy-based record of CO2 concentrations ([CO2]), based on Betula nana (dwarf birch) leaves from the Hässeldala Port sedimentary sequence in south-eastern Sweden, is presented. The record is of high chronological resolution and spans most of Greenland Interstadial 1 (GI-1a to 1c, Allerød pollen zone), Greenland Stadial 1 (GS-1, Younger Dryas pollen zone) and the very beginning of the Holocene (Preboreal pollen zone). The record clearly demonstrates that i) [CO2] were significantly higher than usually reported for the Last Termination and ii) the overall pattern of CO2 evolution through the studied time period is fairly dynamic, with significant abrupt fluctuations in [CO2] when the climate moved from interstadial to stadial state and vice versa. A new loss-on-ignition chemical record (used here as a proxy for temperature) lends independent support to the Hässeldala Port [CO2] record. The large-amplitude fluctuations around the climate change transitions may indicate unstable climates and that “tipping-point” situations were involved in Last Termination climate evolution. 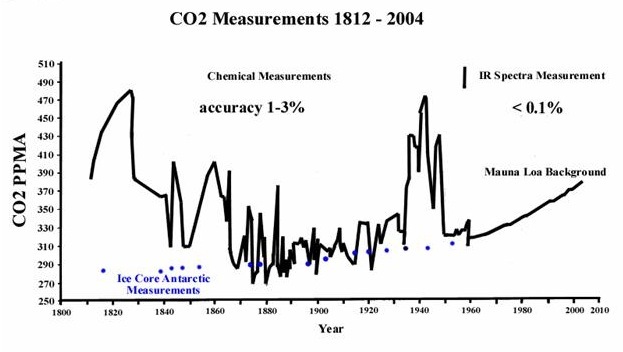 The scenario presented here is in contrast to [CO2] records reconstructed from air bubbles trapped in ice, which indicate lower concentrations and a gradual, linear increase of [CO2] through time. The prevalent explanation for the main climate forcer during the Last Termination being ocean circulation patterns needs to re-examined, and a larger role for atmospheric [CO2] considered. ► A stomatal proxy-based CO2 record from the Last Termination is presented. ► The stomata based CO2record is much more dynamic than ice core-based CO2 records. ► CO2 first increases abruptly before decreasing at cooling transitions and vice versa. Those are all great quotes, thanks. Is there a free online version of his textbook somewhere?